So far, my young friend has harvested a bowl full of cherry tomatoes, most of which were on the plant when we bought it. My son really, really wants to pick some of that lush, green basil, even though he has 500 plants of purple basil ready to harvest. I had to drag him away to protect that basil, since it is not ours. Although, I don't think my friend knows how to use it anyway. Still not ours. The tomato plant shows a really perfect example of what not enough light looks like, because half of it is getting enough! See how the side toward the sun is bushy and green? And the side toward the wall is long? The wall side is not getting enough sun. 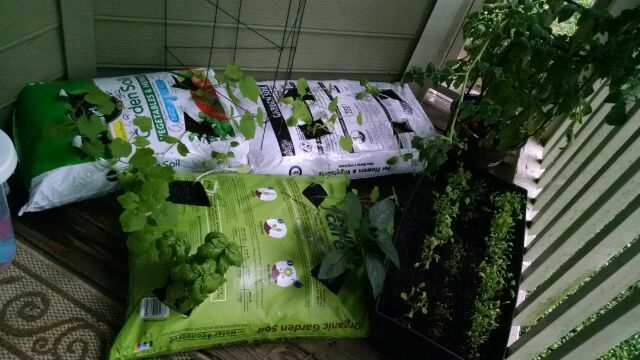 This problem could have been mitigated by turning the tomato plant every day, but that didn't happen. 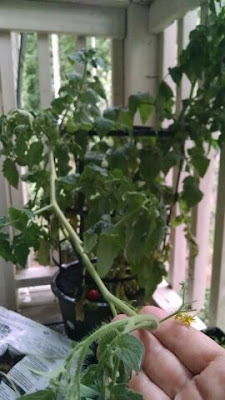 What's more is, if the tomato plant had been turned every day, the whole thing may have gotten long and floppy instead of just one side. These are all really great learning experiences, but alas, they will have limited impact on the growth and harvest of the vegetables. Absolutely, the plants will not produce as much under these conditions, BUT! My friend is a beginner. This is probably the best she was going to get on her first try, even with more sun. And don't be mistaken, she WILL GET VEGETABLES. Found your blog by accident today while scrolling through...we have made Beet pickles for several years now. Honey Bear cooks the beets in boiling water just long enough to loosen the skin then takes it off under running cold water while wearing disposable gloves...Sounds like yours were a hit. This information is very interesting. Thank you for sharing and good information.